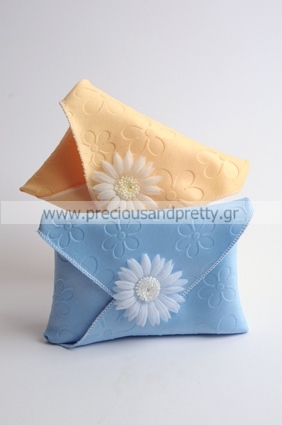 Greek christening favors for girl envelopes made with daisy pattern fabric, blue or yellow color, decorated with a cute white fabric daisy. These bombonieres are also available in white, pink, light green and orange color and contain tulle with 5 sugar coated almonds of the company Hatzigiannakis. https://www.preciousandpretty.com/2012/03/greek-christening-favors-girl-envelopes.html Greek Wedding Favors|Orthodox Crowns|Stefana|Baptism Invitations Greek christening favors for girl with daisies B22 Greek christening favors for girl with daisies B22 by Greek Wedding Favors|Orthodox Crowns|Stefana|Baptism Invitations Product #: Greek Wedding Favors|Orthodox Crowns|Stefana|Baptism Invitations_3671238565584836814 5 stars out of 5 reviews.